How did last Thursday’s march on Horn Hall go? The above image was sent by a reader. Below is an image from Divest Williams. 1) Which faculty/staff were involved in this march? It would be fun to set up a debate with them make fun of them! 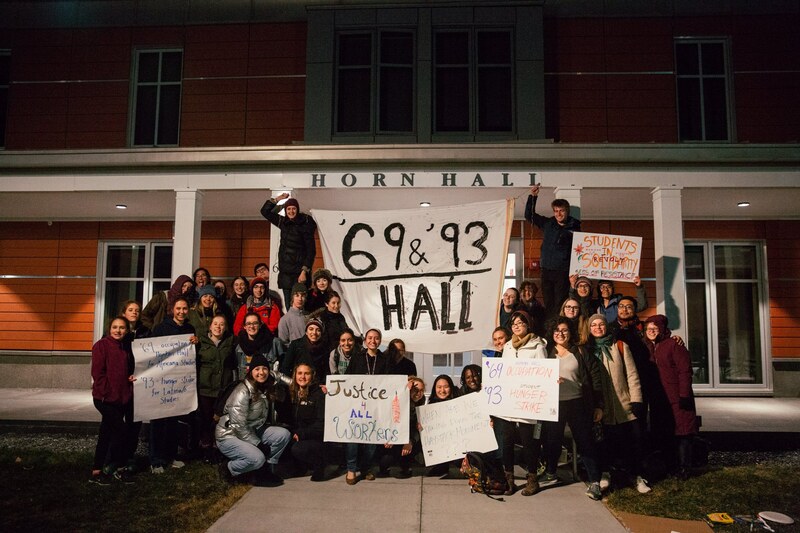 On Thursday night, we gathered at a town hall discussion to assert student power and rededicate Horn Hall to two student activist movements of the past: 1969 Afro-American Society occupation of Hopkins Hall and the 1993 hunger strike for Latino/a studies. Not bad reasoning. Few love Williams history more than EphBlog. And we certainly need someone to write a history thesis about the 1993 hunger strike. 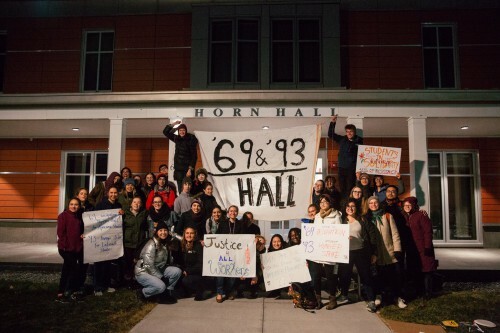 That all said, ’69 & ’93 Hall as a name for a building just does not work for me. Why not something simpler like Bolin Hall? 3) Should we be surprised at how heavily female (70%? 80%?) the march was? I am surprised, but perhaps that just reveals my old-fashioned misogyny? 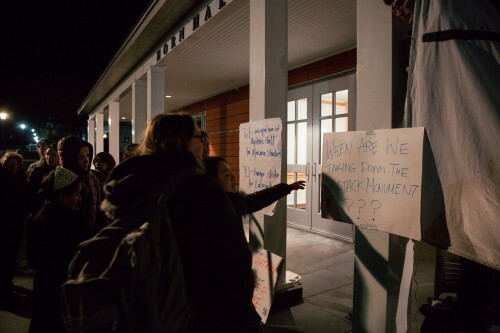 Are other social movements at Williams so gender-skewed? 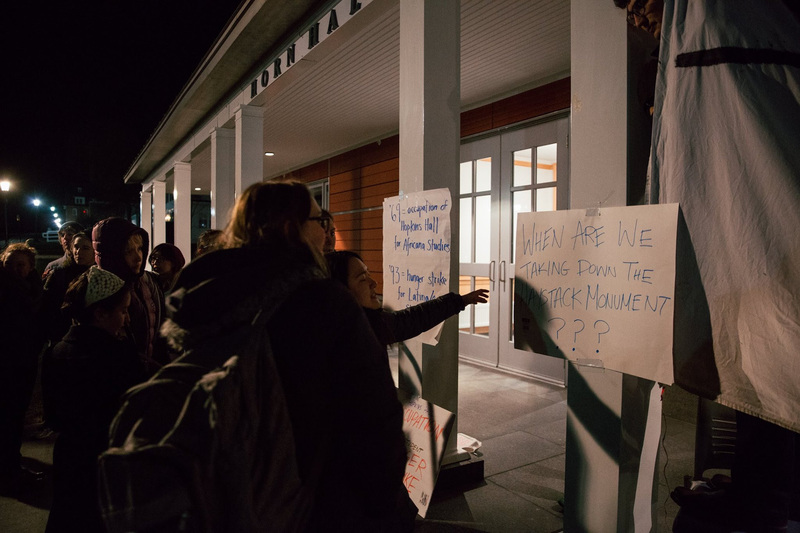 4) The pictures show that the Haystack Monument might be a source of controversy, as we discussed back in October. When will the Merrill Committee report on this topic? Alumni Memorial Hall has worked in many other times and many other places – perhaps at least until something better comes along. The only reasonable thing to do is rename all buildings after extinct species. Start with Hopkins, now to be known as Dodo Bird Hall. It looks to me like complete insanity for the Board of Directors to fail to rename Horn Hall. It is ridiculous to honor a couple that mistreats others, lies to the government, and was sentenced to jail time for their abuses. 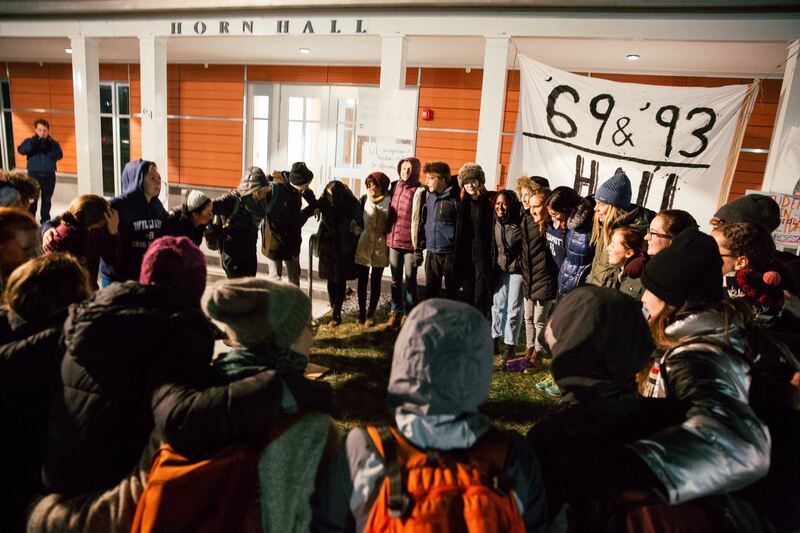 Truthfully, students and trustees who see the full picture of the Horn’s inhumane values should begin questioning everything they have done, supposedly, to help the college. Too often, those who exploit and abuse others – or perhaps use their alumni activities to advance their business interests – cloak their activities in acts of volunteerism and philanthropy. Look at all the child molesters, for example, who volunteer to help out single moms. I’m amazed at the administration’s naive reaction to learning the truth about Joey Horn ’87 and her husband Ragnar Horn ’85. Is the 10 million dollars to be returned? If the College returned every dollar it ever received from wealthy benefactors who did bad/unsavory things, I would guess the endowment would be materially smaller. 1. ”69 & ’93 Hall’ is the product of a committee. 2. “unsavory” and “money” are not strangers. I agree with Whitney. 3. The gift was sincere. 4. Name the hall for a legendary Williams campus figure but acknowledge the gift source on a plaque. This is the fate of people who abuse others. Joan Crawford was one of the most gifted actresses of all time who made more than 80 films. She abused her children and now she is remembered as a cruel abuser as reported in her daughter’s book, Mommy Dearest. For better or worse, that’s how the world works. Williams should return the money, take the building apart, and build something new that would honor the Filipino au pairs who were mistreated by Joey and Ragnar Horn. Our species exists due to the innumerable extinctions of our genetic ancestors. Our silence is violence to their memory. Honestly, would we all be better off under the Inca or the Souix empires? The human race often behaves despicably and will continue to do so long after the memory of the Horns has completely faded. Just in case the young SJWs at Williams College want to name a dormitory in honor of the Comanche Indians, please check out this informative article. Why is it that so many Williams conversations digress into irrelevancies to a point that confuses the simplicity of the issue? Stuck in the meta- always the meta! Act a fool, win the prize, which is not a dorm. I heard when they covered up the log mural, the consideration was the return of the land grant. Funny how easy it is to pick on the dead. One of the wonders of human kind is that it likes best to pick on the defenseless. EphBlog is powered by WordPress and delivered to you in 1.538 seconds using 37 queries..